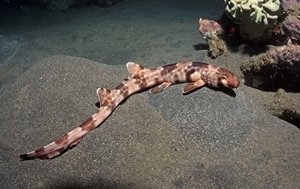 ‘Walking’ sharks, also known as bamboo sharks or longtail carpet sharks, belong to the family Hemiscylliidae in the shark order Orectolobiformes. 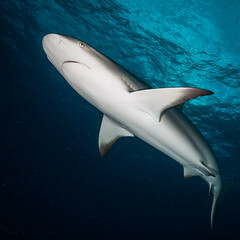 Rather than swim, these slender-bodied sharks ‘walk’ by wriggling their bodies and pushing with their pectoral and pelvic fins. They are relatively small, with the largest species measuring about 48 inches (1.22 m). The newly discovered species, called Hemiscyllium halmahera, reaches 28 inches (70 cm) in length. Dr Allen’s team caught two specimens of Hemiscyllium halmahera near the island Ternate, the Maluku Islands, Indonesia. “Its features include a general brown coloration with numerous clusters of mainly 2-3 dark polygonal spots, widely scattered white spots in the matrix between dark clusters, relatively few (less than 10), large dark spots on the interorbital-snout region, a pair of large dark marks on the ventral surface of the head, and a fragmented post-cephalic mark consisting of a large U-shaped dark spot with a more or less continuous white margin on the lower half, followed by a vertical row of three, smaller clusters of 2-3 polygonal dark marks,” Dr Allen and his colleagues wrote in a paper published in the aqua, International Journal of Ichthyology. According to the ichthyologists, Hemiscyllium halmahera is most similar in general appearance to Hemiscyllium galei from Cenderawasih Bay, West Papua. “It differs in having 7-8 large, horizontally elongate dark spots on the lower side between the abdomen and caudal-fin base, a cluster of solid dark post-cephalic spots, and usually about 25 dark spots on the upper surface of the head,” they wrote.